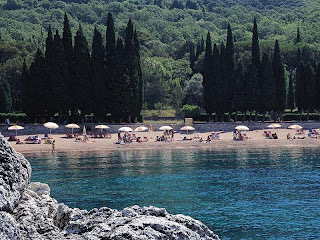 Budva’s Riviera is a stretch of coast with high cliffs and long beaches, all tucked beneath wild rugged mountains, which makes up a considerable part of Montenegro’s coast. If you enjoy swimming or water sports like kayaking, parasailing and jet skiing you have plenty of opportunities along Budva’s Riviera. The water is invariably crystal clear and clean and during three weeks of splashing around in it, I never saw a jellyfish, a broken bottle or even a sharp stone to ruin the experience. 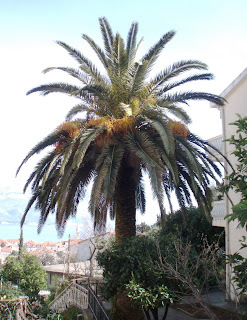 Budva is in many ways an ugly town. It’s like the boomtowns of the Wild West where anything goes. There’s a lot of construction going on and a myriad of street vendors, selling mostly stuff you don’t need at rather stiff prices. The long, long beach, called Slovenska Plaza, is among the redeeming features. Even though it is narrow in places, it’s so long it feels spacious anyway. The beach is lined with bars and restaurants, some of which are quite nice. My favorite part of Budva is the Old Town, where you can walk in medieval streets and relax in one of the many nice cafes and bars. Another nice experience in Budva is the Mogren beach which lies at the end of the town square. It’s smaller than Slovenska Plaza and more peaceful. It’s a great place to have a drink before dinner. In the 1930’s Becici was selected by tourists to be Europe’s most beautiful beach. 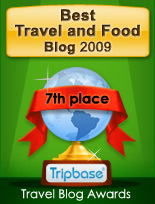 It must have been glorious back then: A semi circle with miles of sandy beach, blue ocean and dramatic green mountains. It’s not any more, though. One part of the beach now has five huge hotels, most of them not exactly charming. 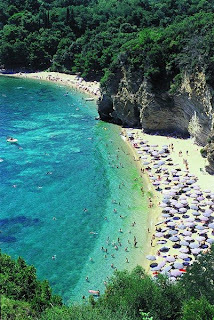 The other part of the beach is lined with bars, grills, street vendors and beach clubs in the boomtown style of Budva. Rafailovici is a tiny village with a handful of restaurants and hotels at the far end of the Becici bay. It’s a charming place with a slower pace. The beach can be crowded at times, but no one seems to care and the prevailing atmosphere is one of relaxed enjoyment. Kamenovo is a lovely bay. The hill is too steep for hotels, but lots of people come here to spend the day. 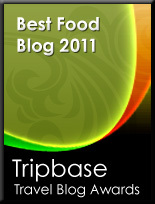 It’s a short walk from Rafailovici and there are several bars and one or two quite basic restaurants. This little village has one or two hotels and a very nice little beach. The beach was a little crowded, but I didn’t mind. There are several restaurants right on the water’s edge, where you can have a very nice seafood dinner watching the sun set and the swallows flying over the ruins of an old chapel on a little island in the bay. My best moments this summer were spent in Przno. 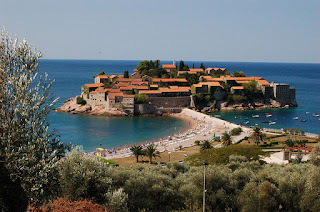 Sveti Stefan is famous for it’s luxury hotel by the same name, an entire little fisherman’s island converted into lodging for the rich and famous. But there is also a nice public beach here, which can be reached by boat or bus from Budva and Becici. 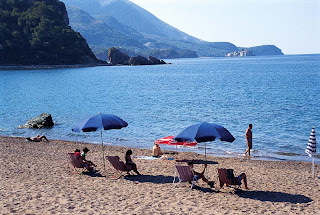 Many of the beaches along Budva’s Riviera are too noisy for my taste, especially in Budva and Becici where there is a number of outdoor bars and nightclubs along the beach. Some of these are quite charming, but many of them are noisy to the point of ruining any chance of a conversation in their vicinity. I stayed in Becici and enjoyed myself, but after two weeks I was desperate for a quiet space: The hotel played music in the restaurant for breakfast lunch and dinner and there was music by the pool and on the beach. And the neighboring beach also played music, as did the beach bars along the beach. As a rule of thumb, the farther away from Budva you get, the more quiet it gets. 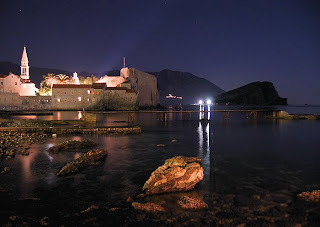 Budva and Becici are noisy at all hours, while Rafailovici is quieter. Kamenovo can get noisy by day but is quiet in the evening. Przno and Sveti Stefan are peaceful and quiet.